MONTGOMERY, Ala. (AP) - The parents of a black man killed by a police officer who mistook him for a shooter at a shopping mall joined chanting protesters outside the Alabama attorney general's office Wednesday, a day after the state cleared the officer of wrongdoing. Demonstrators chanted "Hands up, don't shoot" and shouted Bradford's name. "Across the country we've got people being murdered by police. I'm going to call it what it just what it is. Murder. 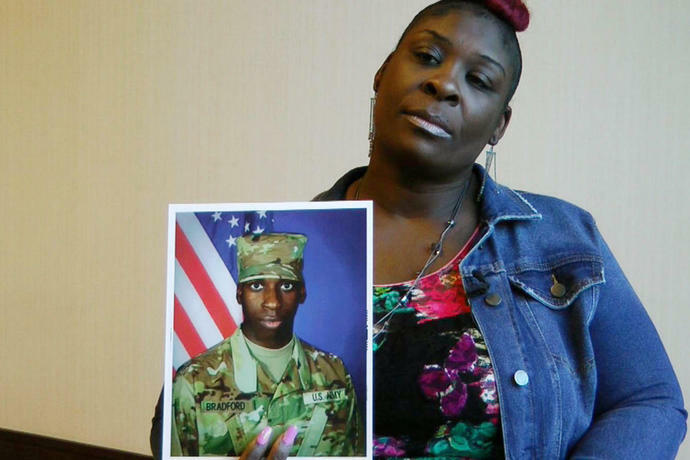 My son is gone," said Emantic Bradford Sr., who has publicly accused authorities of covering up details of his son's death. Bradford called Marshall a "coward" for not meeting with him. Marshall said his chief deputy met with the family and showed them video of the shooting. EJ Bradford was killed Thanksgiving night by a police officer responding to a shooting at a shopping mall in the Birmingham suburb of Hoover. Marshall's report said the officer mistook Bradford for the gunman, but was still justified in the shooting because Bradford was running with a handgun drawn in the crowded mall and appeared that he was going to hurt others. Marshall told The Associated Press on Wednesday that his office determined that the officer acted reasonably under the circumstances. Marshall disputed assertions from the Bradford family attorney that body camera footage, which was not publically released, showed an officer, or officers, pumping their fists over Bradford's body. The attorney general's office took over the investigation from the local district attorney, the county's first African-American district attorney. The family objected to the move. Some of the demonstrators later Wednesday banged on the doors of Marshall's office and shouted that he should meet with the family. Two women were arrested for disorderly conduct after police ordered the crowd to disperse. 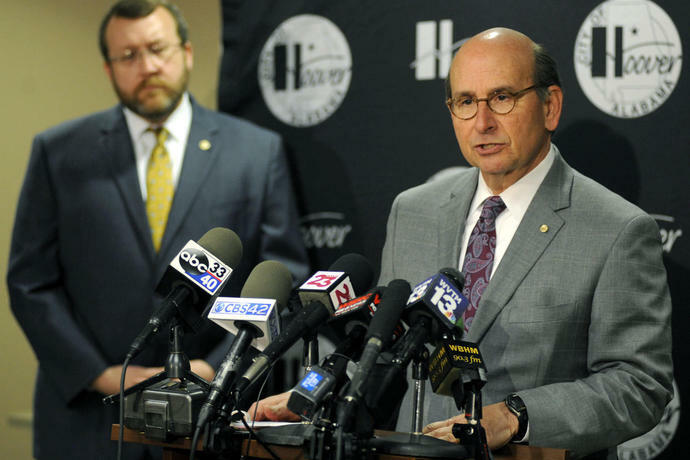 At a news conference, Hoover Mayor Frank Brocato said the shooting caused anxiety for the whole city, where days of protests were held afterward. "We're relieved to have this report in front of us now," said Brocato. He wouldn't comment on details of the probe. While no civil lawsuit has been filed over Bradford's death, the city will pay for the legal defense for the officer in any litigation, Brocato said. Authorities haven't released the name of the officer, who was taken off patrol following the shooting. "The officer will go through a process of returning to work," Brocato said, adding that the city will conduct its own review. 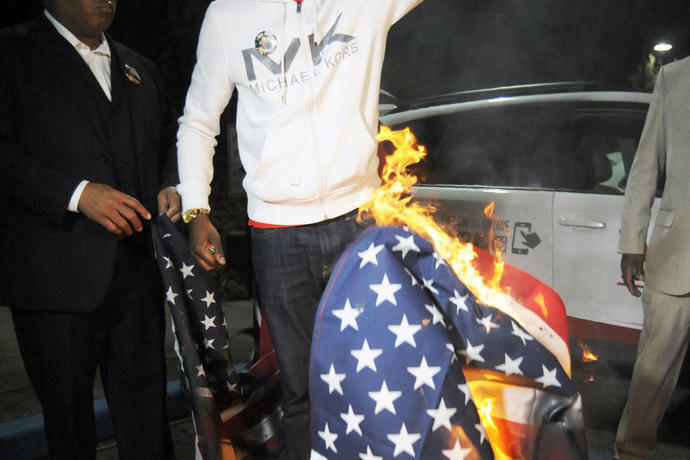 Demonstrators burned U.S. flags outside Hoover City Hall after the state's decision. The incident unfolded Thanksgiving night in the mall crowded with Black Friday shoppers. A friend of Bradford's and a bystander were injured in the initial shooting. Police were nearby, according to Marshall's report, and shot Bradford within seconds. Authorities said Erron Brown, 20, was subsequently arrested and charged with attempted murder in connection with the gunfire. Associated Press writer Jay Reeves in Hoover, Alabama, contributed to this report.